For expert tips on medical sales careers, we conducted a Q&A session with Robyn Melhuish, communications director of MedReps.com, a job board which gives members access to the most sought after medical sales jobs and pharmaceutical sales jobs on the Web. Melhuish provides excellent advice to current and aspiring medical sales professionals regarding how to succeed in the competitive, exciting, and lucrative field of medical and pharmaceutical sales. Q: What advice would you give to college graduates coming out of school seeking entry level careers in medical sales? What are hiring managers seeking in new grads? Robyn Melhuish: Do your research. The more you know about the industry, the better. Hiring managers are looking for ambitious grads who are knowledgeable about the pharma or medical device industries. The best way to learn is to talk to people already on the job - shadow them if possible. And of course, the internet offers countless resources too. Frequent websites that focus on industry news, follow blogs with job search advice specific to medical sales, set up Google alerts to track news from the companies you’re interested in, and spend time on company websites learning about their products -- there are even videos available of surgeries using the devices you hope to sell. Beyond industry knowledge, employers are looking for sharp, young professionals who are quick learners and effective communicators. Recent grads with a background in both business and life sciences are highly desirable. Former college athletes and those who held leadership positions, either in student government or a fraternity/sorority or other clubs, are more likely to be noticed. Q: What tips would you give to salespeople without healthcare/medical sales experience, for breaking into a career in medical device or pharma sales from another industry? Is it feasible to make that transition from another sales role without healthcare experience? Melhuish: It is definitely possible to transition to medical sales without any experience in healthcare. Sales professionals with a background in business to business sales, specifically copier sales or other office equipment, tend to do particularly well. Retail sales experience is not as relevant. Some jobs are stricter in their requirements than others, so find out which skills are needed for the jobs you are interested in, and apply to jobs that most closely match your skill set, education and experience. The best thing you can do to make the transition is show the employer your achievements at previous jobs by highlighting your numbers - rankings, percent to quota, and revenue generated. Show employers that you are hard-working and have a track record of delivering results. Q: Besides the great earning potential, what are some of the perks and benefits of working in medical sales? Melhuish: In addition to the great compensation and benefits, medical sales reps often have a lot of flexibility and autonomy in their jobs. They aren’t tied to a traditional office and instead are building relationships and visiting physicians and hospitals. 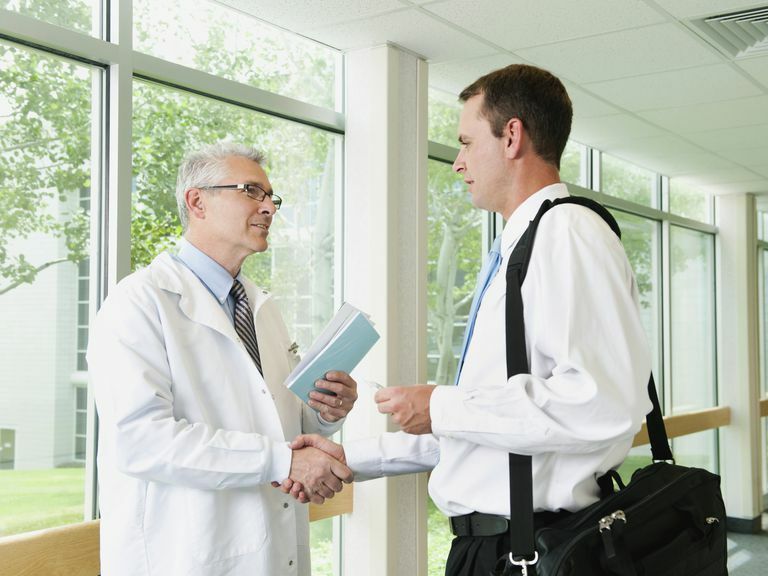 Medical sales reps also have an opportunity to improve patient care. Sales reps educate physicians on new devices and medications, answer questions about new products, and assist with devices in the operating room. Q: What are some of the greatest challenges or drawbacks of working in medical / pharma sales? Melhuish: There are a lot of changes happening in healthcare, and it can be difficult for reps to keep up with them and to navigate the complex healthcare system. The field does require a lot of hard work and a lot of hours. But for those who are dedicated to the career, it is rewarding. Q: What qualities/characteristics/skills are hiring managers seeking in experienced medical sales reps for mid-career or higher level jobs in medical sales? Melhuish: Hiring managers are looking for experienced, medical sales reps, who have a proven record of consistent results. They should know their niche inside and out - products, regulations, competition, reimbursements, etc. Ideally, they also have existing relationships with doctors, hospital administrators, and other relevant decision makers. Q: When hiring managers are screening resumes for medical sales reps or pharma reps, what are they looking for on a resume? Melhuish: On a resume, hiring managers are looking for numbers. For each previous position, you need a bulleted list of your achievements backed up with sales stats. Recruiters also want to know the types of products you sold and who you sold them to. Q: Are there any professional associations you&apos;d recommend for current or potential med sales reps to join? Melhuish: There are some professional associations for medical sales out there, but I recommend current and potential medical sales reps network on their own and associate with the professionals and resources that work best for them. There are a multitude of websites and blogs where med sales reps can find the information and resources they need. In addition, there are plenty of experienced medical sales reps who are happy to discuss the industry and their jobs, whether you belong to an association or not. Q: Any other related information or advice regarding medical sales careers you&apos;d like to share with readers that we haven&apos;t already covered? Melhuish: Breaking into medical sales isn’t easy. Hiring managers are looking for truly exceptional candidates who are smart, competitive, and hungry for a challenge. It’s not for the faint-hearted, but where there is determination, there is usually a way! Thanks again to Robyn Melhuish of MedReps.com for providing our readers with these expert tips for medical sales careers. Interested in learning more? Connect with Robyn and MedReps.com on Facebook, Twitter, and Pinterest. Which Cities Have the Most Medical Sales Jobs? What Does a Pharmaceutical Sales Rep Do?